Hello my devils & ghouls. I apologize I forgot the page I found it on! This post made me think a lot about what we take for granted in life. We sometimes put too much of ourselves up to please others around us and live the life they want for us (which I’m guilty of). We over work ourselves to satisfy the “keep up with the Jones’s” mentality that we’ve been brainwashed in. We tend not to share our honest feelings due to the overly sensitive society we live in. We ignore our friends and become anti-social. And we also tend to keep ourselves in a mentality that isn’t all to helpful. This of course, is just my opinion / observation. I know that when it comes to my time on the death bed, I DONOT want any of the above to be coming out of my lips. I want to share stories of grand times, bad times, accomplishments, and failures. I want to be able to pass on wisdom to whomever will be listening there on my death bed. I want to leave a mark that even though you can be a little wonky in the head, you can make a difference in yourself and those around you. Just recently, I got a part time job to help the family business. I started to make new friends and even bump into old ones! The reconnection with the old friends made me feel good inside! Even though it’s been a long time, we picked up where we left off. I started to realize how much I let the anxiety and depression get to me. I am missing out on a lot. For the first time in years, I actually sang and played my bass without any worry if I screwed up or not. Why? Because screw ups will show me what I have to work on. I’m NOT perfect. I’ve tried so long to be perfect in someone else’s image. But I’m not going to do that anymore. And will always be Mercy. 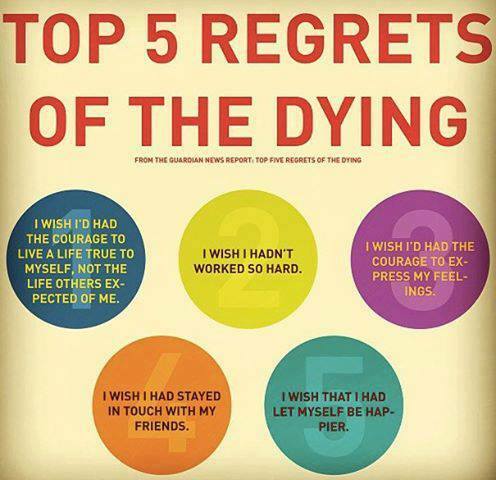 I don’t want to have any regrets when I’m Dying… How about you?